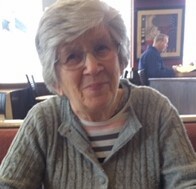 WATERTOWN-Evelyn R. Queal, 87, passed away on Monday March 25th, 2019. Arrangements have been entrusted to Cleveland Funeral Home, Watertown. Evelyn was born on April 2nd, 1931 in Lafargeville, NY to the late Phillip and (Addie) Rowena (Blatz) Zang. Evelyn married Harry L. Queal in 1950. Evelyn was heavily involved in Asbury United Methodist church and their events. She took care of the church nursery with her family for over 25 years. She was a Girl Scout Leader and a Den Mother. She volunteered over 350 hours a year crocheting blankets for the baby bundles for the servicemen’s families at Fort Drum for many years. She loved to Square Dance and was involved in the Red Hat Society. She was an avid sewer and crafter. She spent a lot of her time walking around town and with her family. Evelyn is survived by her children: Rowena (David) Kraemer, Rochester, NY, Edward (Theresa) Queal, Watertown, NY, Jean Marie Queal, Watertown, NY, and Cynthia (Tom) Barker, Watertown, NY. Her siblings: Lee (Lillian) Perkins, Clayton, NY, George (Mariam) Bowes, Lafargeville, NY, Glorianne (Floyd) Garnsey, Pardeeville, PA, and Phillip Zang Jr., Richland, NY. She is also survived by two daughter-in-laws: Sandy Queal, and Sandra Queal, along with 16 grandchildren, 24 great-grandchildren, 3 great great-grandchildren, several nieces and nephews, and a close family friend Cathy Tibbles. She is predeceased by her parents, her husband, and three of her children: Robert S. Queal, Roberta Koch, and William C. Queal. She is also predeceased by two of her siblings: Louise Reid, and Dorothy Henry. There will be a memorial service on April 6th, 2019 at Cleveland Funeral Home in Watertown, NY at 1:00pm. Online condolences may be made at www.ClevelandFHInc.com.